Let’s talk about courgettes. Or zucchini. Whatever you call them, it’s impossible to avoid their charms and abundance during the summer months. When we were in Italy a few weeks back our neighbour gifted us a bowl of freshly picked courgettes and their flowers which we respectively grilled, grated into a frittata with pecorino and softened in butter. 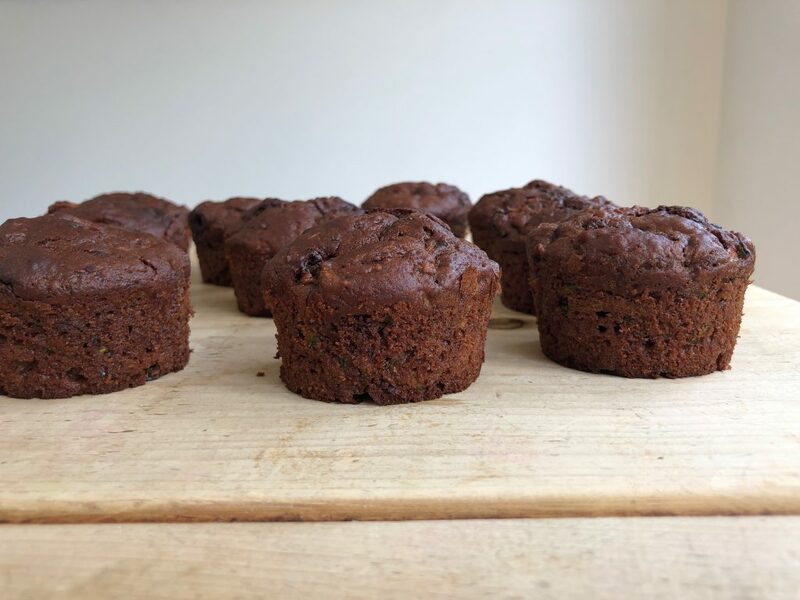 Back in the UK we picked an enormous bag full from the local farm and while most made it into savoury dishes, I couldn’t resist saving a few for some sweeter baking experiments. Grated courgette has much the same effect as carrot in cakes, adding a beautiful moisture and texture to the crumb. All but the most delicate summer specimens are a little less sweet, so I’ve added a mixture of brown and caster sugar along with chocolate chips which puddle through each mouthful: molten when warm and firming up into satisfying shards once cool. The fats here are olive oil and yoghurt – for texture rather than flavour so the former should be mild, or substitute for vegetable oil if that’s all you have to hand. With six weeks – give or take – until our new arrival hits the scene, I’m starting to fill up our freezer. And though the majority of space is intended for healthy suppers we can heat and eat with one hand, there’s will obviously be a dedicated section for sweet treats. 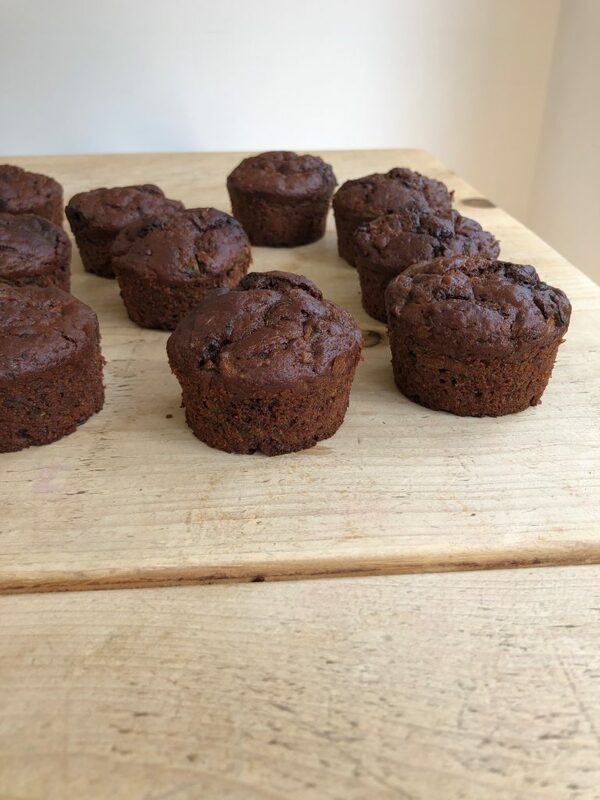 I’m expecting visitors who will want cake with their coffee – and eagerly anticipating the ravenous appetite that accompanies breastfeeding – so supplies like these muffins are slowly stacking up. 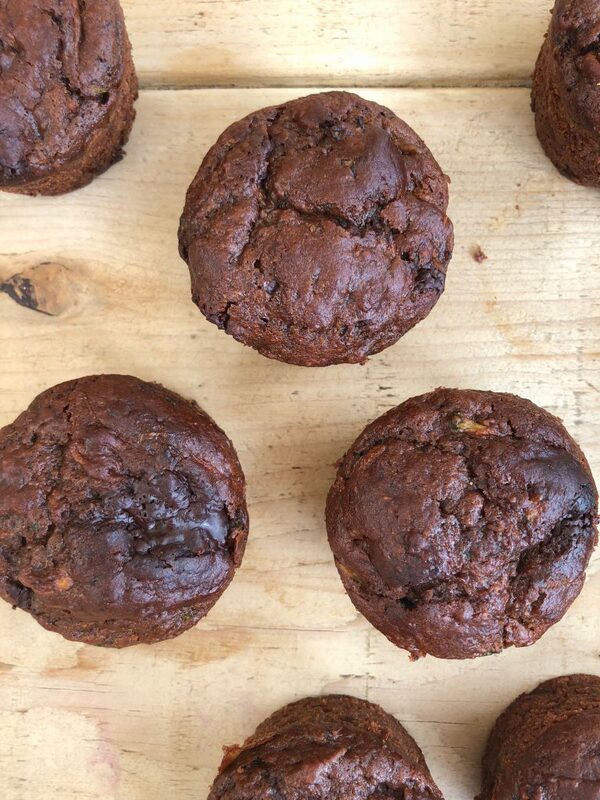 This recipe makes twelve chocolaty beauties, six of which we ate this week with the rest stashed away for a day when getting dressed, let alone turning on the oven, might seem a distinct impossibility. 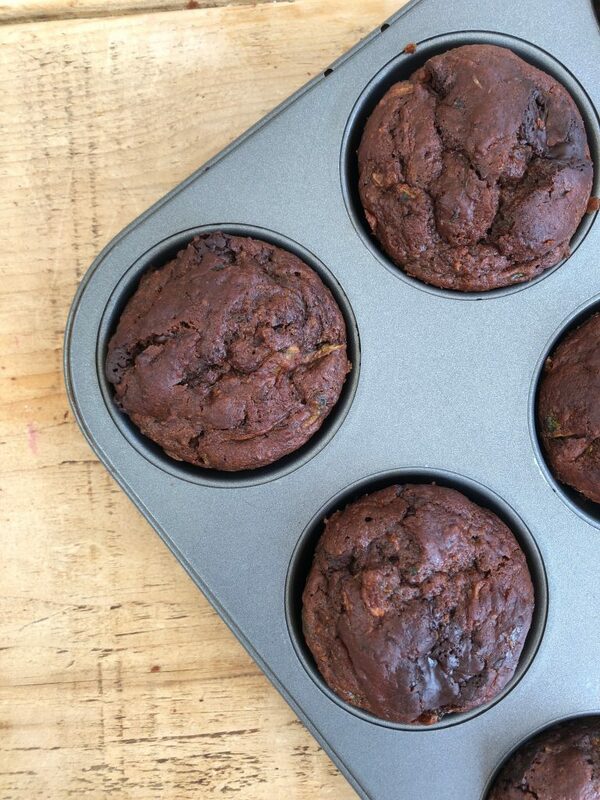 The perfect recipe for using up a glut of summer courgettes, these muffins are sweet, tender and beautifully chocolaty. As with carrot in carrot cake, the grated courgette adds a beautiful moistness to the crumb without being damp - to ensure the perfect texture, lightly pat your grated courgette with a kitchen towel before folding into the batter. Preheat the oven to 175°C. Line a twelve hole muffin pan with cases. In a large bowl mix together the flours, cocoa, baking powder and salt. Set aside. In another bowl, whisk together the yoghurt and olive oil. Add the egg and both kinds of sugar. Beat until smooth and then fold in the courgette and chocolate chunks. Combine wet and dry ingredients and stir until just combined, about a half minute. 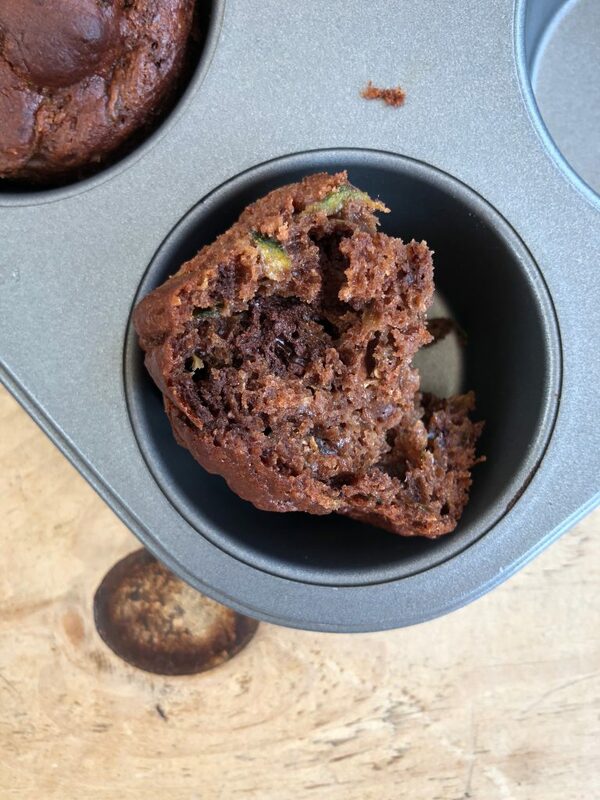 Divide between your muffin cases and bake for 30 - 35 minutes, until firm on the top and a skewer comes out clean in the middle. Let cool in the cases. Will keep for several days in an airtight container and freeze beautifully.